172 pages | 17 B/W Illus. Disruptive leadership is a topic generating intense interest. Companies all over the world are trying to upend their industry through innovative products and services. Becoming a disruptive organization, however, is easier said than done. Even more difficult is being a company that continually disrupts. Is it possible to discern a code for how companies can achieve this? In this highly readable and engaging book, a disruptive leadership framework is proposed in which caring deeply is placed at the center of the model. By turning care into a focal point, a triphasic model is proposed that moves from the personal sphere (individual), to the corporate arena (organizational), and then to the global stage (impact). Nine keys are identified along this path for how companies can realize organizational excellence. While care may seem like a soft concept in the rough and tumble world of business, it is argued how it is actually an inspired manner for providing direction, structure, and know-how that leads to powerful outcomes. 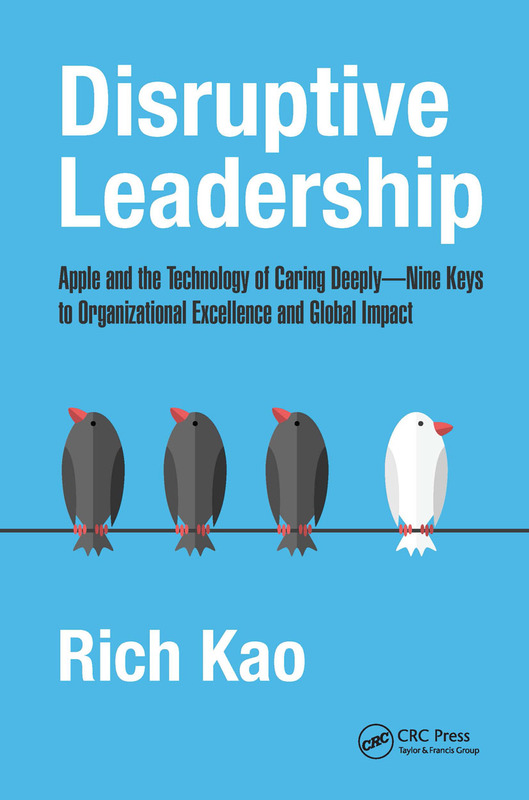 Apple is profiled as a leading example of leveraging what is termed the technology of caring deeply. Other companies, such as Nike, IKEA, Zappos, Starbucks are also profiled. Finally, a leadership canvas is provided to help activate the lessons shared in the book. Rich Kao is a veteran leader of 30 years and lover of dynamic start-ups. He has held research and teaching positions at Kallestad Labs (Hoffman-La Roche), 3M, EQUIP, and is currently a Managing Director with Measurement Technology Laboratories in Minneapolis, MN, a high-tech company specializing in air quality monitoring. He is Founding Pastor of Five Stones Church in Vancouver, BC, a member of the Cabinet of Canadians, and is currently serving the Trudeau Administration on issues of religious freedom and human rights. He has started several humanitarian organizations using aid and leadership platforms to serve the underprivileged in Asia. He is also CEO of a new green company, Hive.City, which is a design studio specializing in converting paperboard into consumer and business products. He has his B.A. in Biology from Carleton College; his M.S. in Immunology from the University of Minnesota, and his doctorate in leadership (D.SL) from Regent University.